Carla Molina feels she is exactly where she was always meant to be. With a passion for financial education and the power of communication, the senior vice president for Bank of America is positioning the company to effectively capture the Hispanic market. Molina, who handles all day-to-day internal and external communications strategy, has also become an advocate within the company for reaching out to Hispanic customers. As a first-generation American, Molina still feels close ties to her roots in Nicaragua, where her parents lived before the country’s revolution in 1979. “It was supposed to be a one or two year thing. The political situation in Nicaragua was very heated, but I don’t think they expected it to be a full-blown war, where they would not be able to return,” Molina says. Born in Houston, Texas, Molina says her family had very little, but her father instilled in her the values of hard work and family support. He was an architect when she was a child and made furniture out of cinderblocks and milk crates. Her father worked tirelessly to put both himself and his children through college. While she was studying at the University of Texas in Austin, Molina became aware of the power of communication. Today, she is senior vice president of corporate communications for Bank of America. “It sparked a real passion in me, and here I am twenty years later,” she says. She began her career at a full-service marketing agency that focused on reaching the Hispanic market in the United States, and Bank of America was one of her clients. When she was ready to move on, the bank made her an offer to join their team. After ten years, mostly at its headquarters in Charlotte, North Carolina, Molina recently moved back to Austin, Texas. This summer, Bank of America will launch its first mobile banking app in Spanish, something Molina has been looking forward to for a long time. 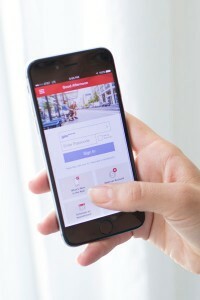 Bank of America’s mobile banking app is supported on Apple, Android, BlackBerry, Kindle, and more devices. Customers can sync with a mobile phone to get balances, transactions, and alerts—without needing to enroll in online banking. 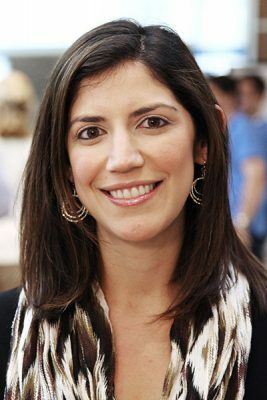 Molina has been involved in the app’s development every step of the way, from advocating for its development to reviewing the language to creating the plan to promote its launch. “Our employees want this, our clients have been asking for this, and of course as a business we all know the opportunity is there,” she says. She also oversees the company’s Trends in Consumer Mobility Report, a survey now in its third year, which looks at annual trends about banking and mobile use. This year, for the first time, the survey will have a segment targeted toward Hispanic consumers, which will serve as a baseline for the future. Recently, Molina has been working to promote the company’s “Better Money Habits” program to Hispanic customers. “Better Money Habits,” an online financial education resource developed in partnership with education innovator Sal Khan and Khan Academy, provides all consumers with easy-to-understand information on a wide variety of personal finance topics through short videos and other tools. Molina is particularly passionate about making financial education tools easily accessible to Hispanic consumers. Anything the industry can do to help people get a better footing, especially those who are just starting out in this country, Molina says, is crucial. “It’s another reason I love what I do, and why I went into communications in the first place: I feel like we can really make a positive impact in our communities through education and information,” Molina says. Aside from keeping customers well-informed, Molina’s day is driven by whatever is going on in the news or financial markets, putting out fires anywhere she can. “There is no typical day,” Molina says. Her responsibilities also include developing her corporate team, researching trends, and crafting long-term communications strategies. Those strategies must be designed to adapt to the continuously changing ways consumers utilize financial products. The mobile revolution also means that Molina has to encourage her colleagues to keep telling the Bank of America story in new ways. Instead of just sending out a press release, they are learning to share stories through social media, photos, live video, and more. To succeed in a complicated industry today, Molina says companies must be nimble, open to change, and able to adapt frequently. “Embrace change—welcome it. You never know what good things are going to come out of it,” she says. Molina says Bank of America is in a perfect position to launch new and exciting initiatives, and the public is in a place where it wants to embrace them. A few years ago, during the financial crisis, that wasn’t the case. Then and now, Molina says she tries to keep one simple philosophy in mind: assume positive intent.